Ongoing archaeological excavations at Ferryland have uncovered more than 1,000,000 artifacts, including thousands of fragments from English glass wine bottles. Included among these fragments are 19 bottle seals, comprising 17 different types. The following is an attempt to identify the owners of these seals and to provide some insight into the practice of bottle-sealing. 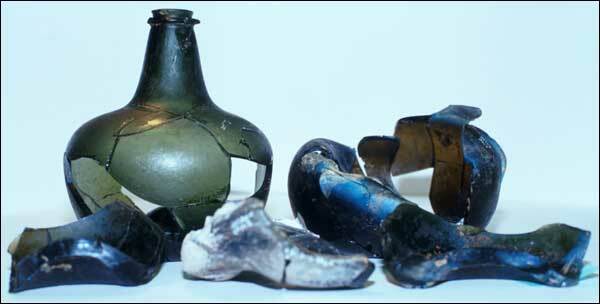 Fragments of bottles found at the Ferryland, NL site. Although English glasshouses began to manufacture wine bottles during the early 1630s, it appears that production was minimal until the 1650s. It is in archaeological contexts of this period that fragments of "shaft and globe" type wine bottles first appear in greater numbers. It was also around the mid-17th century that the practice of sealing bottles began. The seal consisted of a molten glob of glass which the glass blower placed on the shoulder of the bottle and impressed with a circular seal matrix. Inscribed on this seal matrix was a name or initials, sometimes a date or crest (Ruggles-Brise 1949: 15). Although it appears that gentlemen (followed by taverns) were the first to use sealed bottles, wine merchants also adopted the practice by the late 1720s (Morgan 1976: 16; Noel Hume 1969: 61) Around 1740, institutions such as Oxford College began to have their bottles sealed. Over the years, many researchers have questioned the purpose of bottle seals. Buckley (1932: 191) assumed that gentlemen and taverns adopted the practice of sealing in order to protect their bottles from theft, especially when they sent them to the vintner for filling. Dumbrell (1983:19) supported this idea, noting that "with so many bottles arriving at the vintner's for filling it was an obvious precaution to have them marked." It is likely that the tavern keeper had his bottles sealed for this reason since it encouraged customers to return the bottles to the same establishment. Such a seal would also serve as a form of advertisement. However, it is unlikely that theft of a gentleman's bottles was common enough to warrant the extra cost involved in having his bottles marked. As revealed in the household account books of William Russell, the Fifth Earl of Bedford at Woburn Abbey, it was an expensive yet common practice for the gentleman to purchase large quantities of sealed bottles (Thorpe 1938: 192). For instance, on March 5, 1671, the bottle manufacturer Edmond Lewin supplied the Earl with "12 dozen glass bottles with my Lords Coat upon them at 5s per dozen." In July of 1672, the Earl received "2 dozen of marked quart glass bottles at £3 6s" and in September he acquired "6 dozen of marked quart glass bottles at £1 13s." Mr. Green supplied both of these second orders, even though the prices were 6p per dozen higher than those from Mr. Lewin in 1671. Mr. Apthorpe provided the Earl's next orders of bottles possibly because Mr. Green's prices were too high. In March of 1676, Apthorpe supplied "2 dozen plain, quart glass bottles for 7s" and a month later he supplied "18 dozen and 3 quart sealed glass bottles for £4 2s 2p." Thus, Apthorpe supplied sealed bottles at 4s 6p per dozen, a shilling a dozen higher than the cost of plain bottles, but also a shilling lower than Green's price for sealed bottles. In February of 1676, the Earl received his last order of sealed bottles since the remaining orders were for plain bottles. In total, between 1671 and 1691, the Earl ordered 1120 dozen quart wine bottles (approximately 700 sealed) representing an annual consumption rate of 58 dozen or 696 bottles. With such large quantities of bottles being ordered each year, it is likely that breakage was common. Surviving records for a banquet held in 1702-3, in honor of the Second Duke of Bedford becoming a "Knight of the Garder" [sic.] reveal that there were "nineteen dozen of bottles broken and lost" (cited in Wills 1977: 59). Considering the amount of breakage and the fact that the cost of marked bottles averaged one shilling a dozen more than plain bottles, the total cost of sealing bottles was evidently much more expensive. Before a gentleman could even order sealed bottles, he first had to pay an engraver to make and cut a brass die (Dumbrell 1983: 20). In addition, every time the gentleman requested a new order of bottles, he had a new seal made! A cheaper alternative was a clay seal matrix, as revealed during excavations of a glasshouse at Bolsterstone (Ashurst 1987: 202). Another alternative was single-letter stamps mounted in a wooden handle (Noel Hume 1969: 61). Surviving bottle seals, though, reveal that gentlemen rarely purchased these stamps and regardless of which material the seal was constructed from, an additional cost was involved. In consideration of these expenses, it is apparent that a gentleman did not have his bottles sealed only to protect them from theft. During the 17th century, it is likely that the elite ordered sealed bottles to commemorate an event, such as a marriage or birth (Ruggles-Brise 1949: 31). A gentleman could order sealed bottles to refer to the year that he bottled wine. Most importantly, a sealed bottle could serve as a status symbol of the elite. It was during the 17th century that a materialistic attitude developed as spaces became more private and activities, such as entertaining, moved inside the house (Johnson 1996: 16). The elite also used objects to fashion an image of themselves and "to buttress their position in society" (Johnson 1996: 182). Thus, having sealed bottles was simply one way for the gentleman to reveal his status in society. This was especially true during social gatherings where the gentleman's personalized bottles stood on the table in view of all his guests. This appears to be the image Samuel Pepys projected in 1663 when he wrote in his Diary about "Mr. Rawlinson's where I saw my new bottles, made with my crest upon them, filled with wine, about five or six dozen of them" (Armstrong 1970: 220). Pepys seemed to be excited and proud that he could afford sealed wine bottles and even felt the event noteworthy enough to record. Similar, Mr. Povey fashioned an image for himself in 1665 as John Evelyn commented on visiting his "elegant" house. Evelyn wrote in his Diary that he admired, above all else "his pretty cellar and ranging of his wine bottles" (Bray 1907: 387). The Ferryland glass collection contains 19 bottle seals, eight of which date to the 17th century. Most of the remaining seals date to the first quarter of the 18th century. All 19 have the initials or names of private individuals on them. Of the nine seals containing initials, three contain a third initial that represents a spouse's given name. One of these seals also carries the date 1723, which may signify the year that the couple married. The remaining nine seals contain the names of private individuals, the earliest dated one being "John Curtis 1695". Furthermore, two of these seals appear to contain the town names of "Dartmouth" and "Ferryland." All bottle seals belong to the most prominent residents and/or visitors to Ferryland.